There is nothing more enjoyable than spending the day on the open road in Los Angeles, feeling the fresh air and weaving in and out of traffic on your motorcycle. After spending a good few ours touring around you decide to have a well-earned break and take a rest stop. Feeling refreshed and raring to go you go to take off when a wave of doom and gloom comes over you as you realize you have lost your motorcycle keys. Panic sets in, you are miles away from home with no spare key and no idea of how to handle this situation. Firstly this is a much easier situation to resolve than you think it is. One error to avoid is calling a towing company thinking that it will be easier to get your bike towed to a local dealer or even home is going to be the most costly way of solving this problem with a hefty tow charge and dealer charge on top. The easiest most efficient, affordable and time friendly solution is to call a local locksmith. By calling a local locksmith in Los Angeles you will save time, money and a lot of hassle. 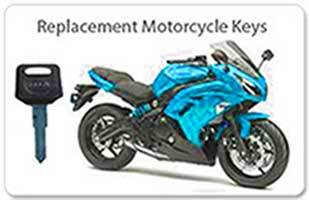 Motorcycle Keys made Los Angeles locksmiths have specialist units for motor vehicles, theses technicians are experienced and carry specialized equipment which means they are able to help you at your location. A good locksmith can normally be by your side within 25 minutes of you calling and being dispatched. When speaking to your dispatcher be sure to inform them of the make, model and year of your bike so that they can provide you with the best service possible. Also ask if the technician is certified, insured and bonded, after all having a cowboy locksmith come out to you could cause more damage than good. Once by your side your technician will ask you to prove your identity and ownership of the motorcycle. This can be done by showing your Driver’s License and a copy of your motorcycle ownership. After he has verified that you are indeed the owner he will get to work with supplying you a fresh set of keys. Your technician will examine the cylinder inside your ignition in order to obtain the key code and simply cut you a new set of keys to match that code, PLUS SPARES!!! On site. You can happily be on your way with relatively little trouble and minor damaged to your pocket. Call your local locksmith Los Angeles today!! !